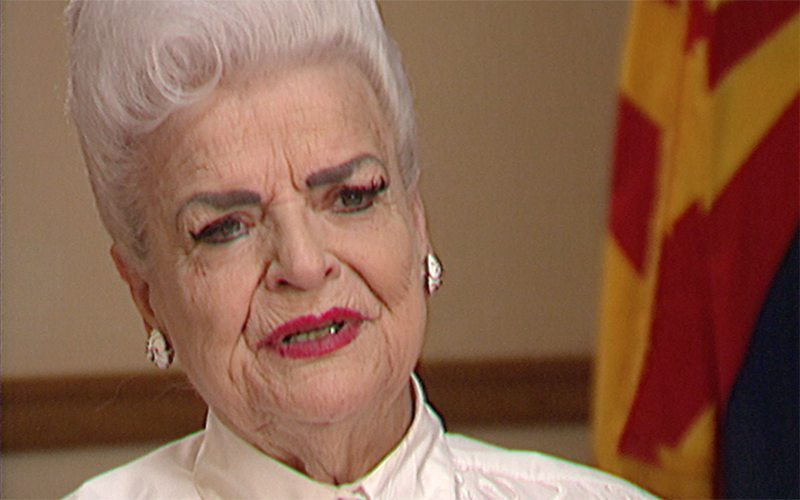 PHOENIX – Rose Mofford, Arizona’s first female secretary of state and first female governor, died Thursday at a Phoenix hospice center. She was 94. Mofford was secretary of state for 11 years before becoming Arizona governor in 1988, ascending as the state’s top leader in a tumultuous time. Evan Mecham, the contentious governor who drew national attention for blunt statements and his withdrawal of a state holiday for Martin Luther King Jr., was impeached for misuse of funds and obstruction of justice. “After such a divisive episode, she rose above the partisanship and brought Republicans and Democrats together to make Arizona stronger and more prosperous,” McCain said in a statement. Recognized for her trademark white beehive and her moves to drive political cooperation, Mofford retired in 1991. She was a lifelong Democrat who spent 51 years in state government, according to azcentral. She was born in Globe, an Arizona mining town, on June 10, 1922 as Rose Perica. She married Lefty Mofford and they later divorced, according to azcentral. On Thursday, Globe residents mourned a favorite daughter and public officials across Arizona paid tribute. Other Arizonans who knew Mofford – personally or by reputation – shared condolences and memories. Arizona Congresswoman Kyrsten Sinema said Mofford “embodied the true meaning of public service – a tireless, thoughtful leader who always put the people of Arizona first. “She was a trailblazer and an Arizona legend. She was a dear friend and role model for me. Governor Mofford’s legacy will live on in Arizona forever,” Sinema said in a statement. Alfredo Gutierrez, who served on Mofford’s transition team after he had left the state Legislature, told 12 News she was a treasure. The Washington Post quoted former Arizona Attorney General Grant Woods as saying Mofford didn’t necessarily seek a spotlight but took on the responsibility handed to her with grace. “She stepped up when she needed to step up,” Woods told the Post.